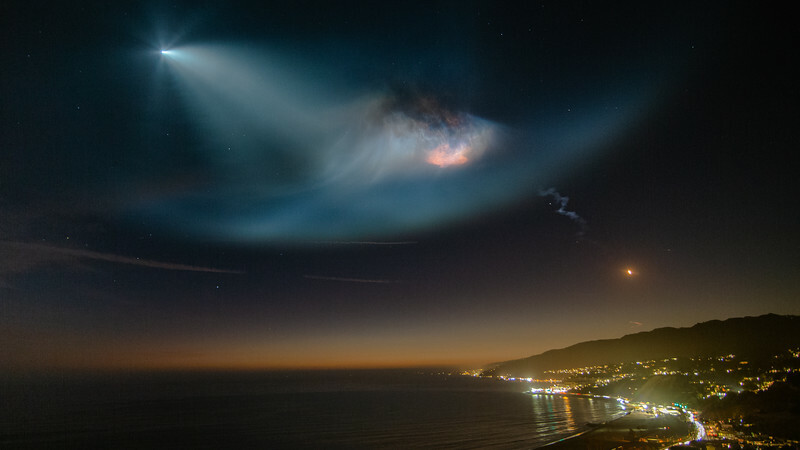 On Sunday, October 7 at 7:21 p.m. PDT, SpaceX successfully launched the SAOCOM 1A satellite from Space Launch Complex 4E (SLC-4E) at Vandenberg Air Force Base in California. The satellite was deployed about 12 minutes after liftoff. It was the first time the 1st stage would land back at Vandenberg. It also was the most spectacular visual event as well! The orange glowing spot at the mid bottom right is the 1st stage returning to Vandenberg. Glad I was there to capture it thanks to my friend Kevin Greene. Please check out his amazing timelapse on instagram @thekevingreene.